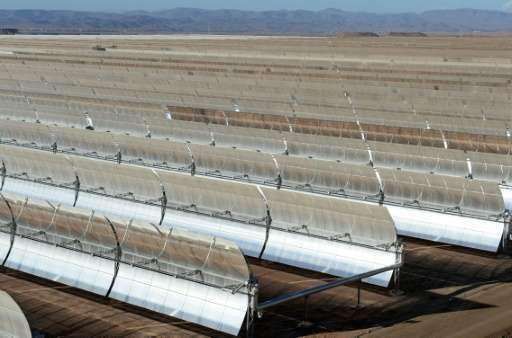 Solar mirrors at the Noor 1 Concentrated Solar Power plant, outside the central Moroccan town of Ouarzazate. No image credits. About 20 kilometres (12 miles) outside Ouarzazate, half a million U-shaped mirrors—called “parabolic troughs”—stretch out in 800 rows, slowly following the sun as it moves across the sky. 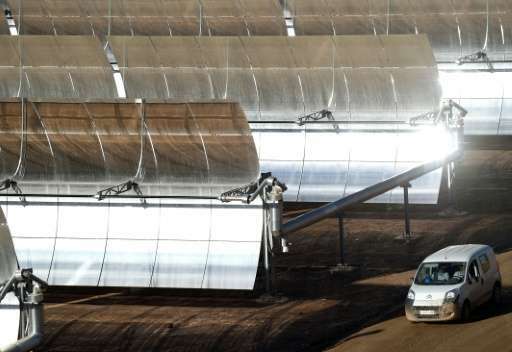 Morocco is boosting its clean energy output with what it says will eventually be the world’s largest solar power production facility. The project’s next phases—Noor 2 and Noor 3—are to follow in 2016 and 2017, and a call for tenders is open for Noor 4. Once all phases are complete, Noor will be “the largest solar power production facility in the world”, its developers say, covering an area of 30 square kilometres (11.6 square miles). The so-called “greenhouse effect” is a natural phenomenon—an invisible blanket of gases including small amounts of carbon dioxide (CO2)—that has made Earth warm enough for humans to survive on it comfortably. King Mohamed VI launched construction of the solar plant, called Noor 1, in 2013, at a cost of 600 million euros ($660 million) and involving roughly 1,000 workers. Humanity’s annual output of greenhouse gases is higher than ever, totalling just under 53 billion tonnes of CO2 in 2014, according to the UN. 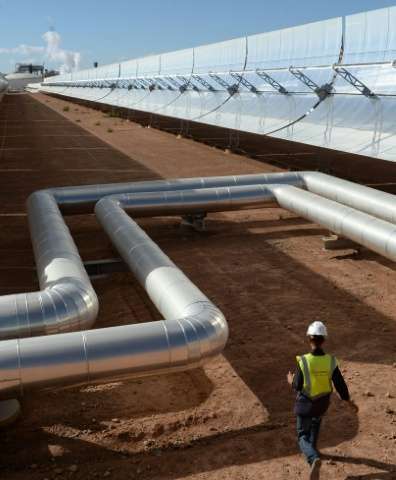 But Rabat has not abandoned fossil fuels altogether—last December, Amara announced a multi-billion-dollar project to step up Morocco’s search for natural gas to produce electricity. Phil Plait takes us for a closer (eye safe!) look at the two-octillion ton star that rules our solar system. We look at the sun’s core, plasma, magnetic fields, sunspots, solar flares, coronal mass ejections, and what all of that means for our planet. In central Karnataka state, 120 miles north of Bangalore, the lush jungle of India’s west coast gives way to dry scrubland. Sunflowers, onions, chilis, and groundnuts grow in parched fields. In scattered, populous villages, concrete buildings alternate with ramshackle thatched huts. Cows nose through the garbage, and wooden carts drawn by horned oxen crowd the streets. Rough brick-producing factories belch black smoke into the air. Much of the scene appears as it did a century ago. But in a walled compound just beyond the town of Challakere sits an installation that could hold one of the keys to India’s energy future. The project, run by the Bangalore-based Indian Institute of Science (known as IISC), is a test array for concentrated solar power. Rows of shallow parabolic troughs, made of specially coated aluminum, stretch for more than the length of two and a half football fields. Above them are water pipes set to catch sunlight reflected from the troughs. When the project begins operation in a few weeks, the water in the pipes will be heated to 200 °C (392 °F); the hot water will go to a heat exchanger attached to a small turbine that will produce 100 kilowatts of electricity. A part of the Solar Energy Research Institute for India and the United States (SERIIUS), this small solar array will be used to test various reflective materials and heat-transfer fluids (including, for instance, molten salt in addition to water) from multiple manufacturers. Dozens of small wireless sensors will collect data and send it via the Internet to a dashboard at IISC, where it can be analyzed and catalogued. The objective, says Praveen Ramamurthy, a professor of materials engineering at IISC, is to find the combinations of components that best suit conditions in India, which under the National Solar Mission of Prime Minister Narendra Modi is poised to become one of the world’s largest solar markets in the next seven years. Concentrated solar power, in which reflective troughs heat up water that is then fed to heat exchangers and turbines to produce electricity, could play a key role in India’s energy future. India’s solar mission is important not only to India but to the entire world. The world’s third-largest emitter of greenhouse gases, India is an energy-starved, coal-dependent country, where more than 300 million people, according to official estimates, live without electricity and millions more have only spotty service from the grid. Modi has pledged to create dozens of “ultra mega solar power parks,” of 500 megawatts and above, to feed power to the grid, even as the National Institute for Rural Development embarks on a program to bring rooftop solar panels to thousands of India’s impoverished villages. Piyush Goyal, the minister of power, has said that the government’s energy policies will reduce annual carbon dioxide emissions by 550 million tons. Whether India can industrialize and provide universal electricity access while reining in greenhouse-gas emissions will help determine whether the world can avoid catastrophic climate change. 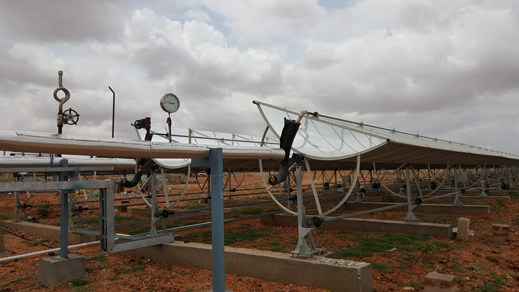 The Challakere test array will eventually include solar photovoltaic installations, as well as concentrated solar. Ramamurthy’s own research focuses on developing polymers to encapsulate solar panels and seal them against high temperatures and humidity, which tend to rot the adhesives that hold conventional solar panels together. Dust and degradation are also major problems in India. And then there are the monkeys. While solar PV is expected to provide the majority of solar power generation in India, concentrated solar is also of keen interest, as it can be put to a variety of non-electricity applications. Those brick factories in Karnataka, for instance, are mostly illegal, and they bake the bricks using firewood. That causes deforestation and heavy emissions of carbon dioxide. Using concentrated solar power to bake bricks would be a huge boon to the environment. In other words, the work being carried out at Challakere will help India, whose energy sector in many ways has progressed little since the 1960s, leapfrog its way to a 21st-century solar industry. China, which is on track to build the equivalent of one new 600-megawatt coal-fired power plant every 10 days for the next 10 years, is also committed to boosting the amount of emission-free energy it produces. By 2030, the government announced this week, it wants to reduce fossil-fuel energy by 20 percent. To that end, the country is already constructing its largest solar power plant to date — a 10-square-mile facility in the Gobi desert that’s expected to have a capacity of 200 megawatts, reports via National Geographic. Two hundred megawatts is enough to supply electricity to one million households. Named Delingha, the concentrating solar thermal project — similar to Ivanpah in California’s Mojave Desert — will sprawl across 6,300 acres of vacant land in the Qinghai province once completed. The satellite images above, courtesy of NASA, show just how much progress has been made. On the left, the new power plant is just beginning to creep over the desert on October 15, 2012. On the right, the surface area covered has tripled by May 22, 2015. Six fields of mirrors will direct sunlight to a tall tower, each of which will generate about 135 megawatts of electricity when fully operational. 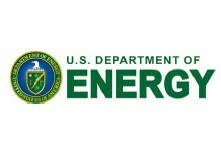 Overall, the plant will reduce carbon emissions by 20 millions tons over its lifetime. “China’s carbon dioxide emission will peak by around 2030 and China will work hard to achieve the target at an even earlier date,” Chinese Premier Li Keqiang said after meeting French President Francois Hollande in Paris to agree upon a U.N. climate deal. 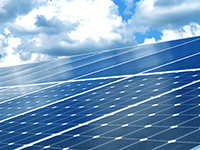 Delingha is set to go online in 2017 with other solar power plants in China following. Since Chinese solar panel manufacturers are the main source of the technology in the world, we can only hope that their direct involvement in this technology will improve solar panel efficiency over time. And reduce fossil-fuel emissions, to boot. Researchers from FOM, the University of Amsterdam, the Delft University of Technology and the University of the Algarve have discovered that when light hits germanium nanocrystals, the crystals produce ‘bonus electrons’. These additional electrons could increase the yield of solar cells and improve the sensitivity of photodetectors. The researchers will publish their work in Light: Science & Applications today. Nanocrystals are extremely small, about a thousand times smaller than the width of a human hair. 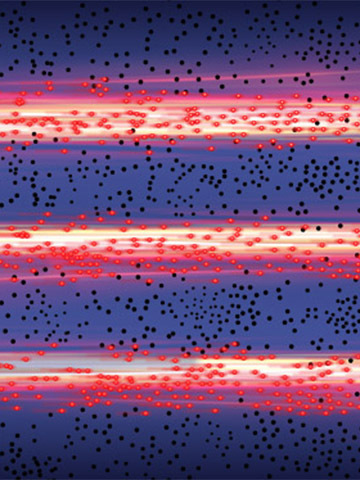 Due to their size, the energy structure of the crystals is dramatically different from that of bulk material. In fact, the bandgap energy depends on the nanocrystal size. Bulk germanium has an energy bandgap of 0.67 electronvolts. By tuning the germanium nanocrystals’ size, the researchers can change the bandgap energy to values between 0.6 and 1.4 electronvolts. This is within the ideal range for optimizing carrier multiplication, or the amount of ‘bonus electrons’.